Cisco Talos has discovered a new cyber threat campaign that we are calling "Sea Turtle," which is targeting public and private entities, including national security organizations, located primarily in the Middle East and North Africa. The ongoing operation likely began as early as January 2017 and has continued through the first quarter of 2019. Our investigation revealed that at least 40 different organizations across 13 different countries were compromised during this campaign. We assess with high confidence that this activity is being carried out by an advanced, state-sponsored actor that seeks to obtain persistent access to sensitive networks and systems. The actors behind this campaign have focused on using DNS hijacking as a mechanism for achieving their ultimate objectives. DNS hijacking occurs when the actor can illicitly modify DNS name records to point users to actor-controlled servers. The Department of Homeland Security (DHS) issued an alert about this activity on Jan. 24 2019, warning that an attacker could redirect user traffic and obtain valid encryption certificates for an organization's domain names. In the Sea Turtle campaign, Talos was able to identify two distinct groups of victims. The first group, we identify as primary victims, includes national security organizations, ministries of foreign affairs, and prominent energy organizations. The threat actor targeted third-party entities that provide services to these primary entities to obtain access. Targets that fall into the secondary victim category include numerous DNS registrars, telecommunication companies, and internet service providers. One of the most notable aspects of this campaign was how they were able to perform DNS hijacking of their primary victims by first targeting these third-party entities. We assess with high confidence that these operations are distinctly different and independent from the operations performed by DNSpionage, which we reported on in November 2018. The Sea Turtle campaign almost certainly poses a more severe threat than DNSpionage given the actor's methodology in targeting various DNS registrars and registries. The level of access we presume necessary to engage in DNS hijacking successfully indicates an ongoing, high degree of threat to organizations in the targeted regions. Due to the effectiveness of this approach, we encourage all organizations, globally, to ensure they have taken steps to minimize the possibility of malicious actors duplicating this attack methodology. The threat actors behind the Sea Turtle campaign show clear signs of being highly capable and brazen in their endeavors. The actors are responsible for the first publicly confirmed case against an organizations that manages a root server zone, highlighting the attacker's sophistication. Notably, the threat actors have continued their attacks despite public reports documenting various aspects of their activity, suggesting they are unusually brazen and may be difficult to deter going forward. In most cases, threat actors typically stop or slow down their activities once their campaigns are publicly revealed. This post provides the technical findings you would typically see in a Talos blog. We will also offer some commentary on the threat actor's tradecraft, including possible explanations about the actor's attack methodology and thought process. Finally, we will share the IOCs that we have observed thus far, although we are confident there are more that we have not seen. The threat actors behind the Sea Turtle campaign were successful in compromising entities by manipulating and falsifying DNS records at various levels in the domain name space. This section provides a brief overview of where DNS records are managed and how they are accessed to help readers better understand how these events unfolded. The first and most direct way to access an organization's DNS records is through the registrar with the registrant's credentials. These credentials are used to login to the DNS provider from the client-side, which is a registrar. If an attacker was able to compromise an organization's network administrator credentials, the attacker would be able to change that particular organization's DNS records at will. The second way to access DNS records is through a DNS registrar, sometimes called registrar operators. A registrar sells domain names to the public and manages DNS records on behalf of the registrant through the domain registry. Records in the domain registry are accessed through the registry application using the Extensible Provisioning Protocol (EPP). EPP was detailed in the request for comment (RFC) 5730 as "a means of interaction between a registrar's applications and registry applications." If the attackers were able to obtain one of these EPP keys, they would be able to modify any DNS records that were managed by that particular registrar. The third approach to gain access to DNS records is through one of the registries. These registries manage any known TLD, such as entire country code top-level domains (ccTLDs) and generic top-level domains (gTLDs). For example, Verisign manages all entities associated with the top-level domain (TLD) ".com." All the different registry information then converges into one of 12 different organization that manage different parts of the domain registry root. The domain registry root is stored on 13 "named authorities in the delegation data for the root zone," according to ICANN. Finally, actors could target root zone servers to modify the records directly. It is important to note that there is no evidence during this campaign (or any other we are aware of) that the root zone servers were attacked or compromised. We highlight this as a potential avenue that attackers would consider. The root DNS servers issued a joint statement that stated, "There are no signs of lost integrity or compromise of the content of the root [server] zone…There are no signs of clients having received unexpected responses from root servers." Established a means to control the DNS records of the target. Modified DNS records to point legitimate users of the target to actor-controlled servers. Captured legitimate user credentials when users interacted with these actor-controlled servers. 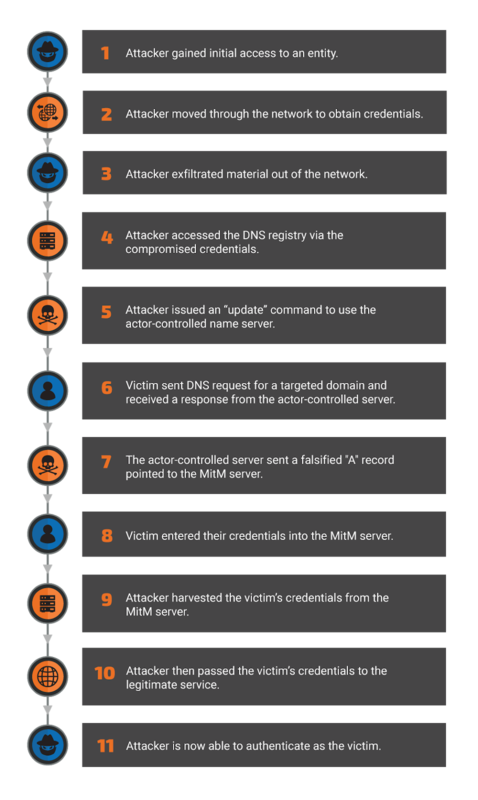 The diagram below illustrates how we believe the actors behind the Sea Turtle campaign used DNS hijacking to achieve their end goals. CVE-2018-7600: RCE for Website built with Drupal, aka "Drupalgeddon"
As of early 2019, the only evidence of the spear-phishing threat vector came from a compromised organization's public disclosure. On January 4, Packet Clearing House, which is not an Internet exchange point but rather is an NGO which provides support to Internet exchange points and the core of the domain name system, provided confirmation of this aspect of the actors’ tactics when it publicly revealed its internal DNS had been briefly hijacked as a consequence of the compromise at its domain registrar. As with any initial access involving a sophisticated actor, we believe this list of CVEs to be incomplete. The actor in question can leverage known vulnerabilities as they encounter a new threat surface. This list only represents the observed behavior of the actor, not their complete capabilities. During a typical incident, the actor would modify the NS records for the targeted organization, pointing users to a malicious DNS server that provided actor-controlled responses to all DNS queries. The amount of time that the targeted DNS record was hijacked can range from a couple of minutes to a couple of days. This type of activity could give an attacker the ability to redirect any victim who queried for that particular domain around the world. Other cybersecurity firms previously reported some aspects of this activity. Once the actor-controlled name server was queried for the targeted domain, it would respond with a falsified "A" record that would provide the IP address of the actor-controlled MitM node instead of the IP address of the legitimate service. In some instances, the threat actors modified the time-to-live (TTL) value to one second. This was likely done to minimize the risk of any records remaining in the DNS cache of the victim machine. Once the threat actors accessed a domain's DNS records, the next step was to set up a man-in-the-middle (MitM) framework on an actor-controlled server. The next step for the actor was to build MitM servers that impersonated legitimate services to capture user credentials. Once these credentials were captured, the user would then be passed to the legitimate service. to evade detection, the actors performed "certificate impersonation," a technique in which the attacker obtained a certificate authority-signed X.509 certificate from another provider for the same domain imitating the one already used by the targeted organization. For example, if a DigiCert certificate protected a website, the threat actors would obtain a certificate for the same domain but from another provider, such as Let's Encrypt or Comodo. This tactic would make detecting the MitM attack more difficult, as a user's web browser would still display the expected "SSL padlock" in the URL bar. When the victim entered their password into the attacker's spoofed webpage, the actor would capture these credentials for future use. The only indication a victim received was a brief lag between when the user entered their information and when they obtained access to the service. This would also leave almost no evidence for network defenders to discover, as legitimate network credentials were used to access the accounts. In addition to the MitM server IP addresses published in previous reports, Talos identified 16 additional servers leveraged by the actor during the observed attacks. The complete list of known malicious IP addresses are in the Indicators of Compromise (IOC) section below. Once the threat actors appeared to have access to the network, they stole the organization's SSL certificate. The attackers would then use the certificate on actor-controlled servers to perform additional MitM operations to harvest additional credentials. This allowed the actors to expand their access into the targeted organization's network. The stolen certificates were typically only used for less than one day, likely as an operational security measure. Using stolen certificates for an extended period would increase the likelihood of detection. In some cases, the victims were redirected to these actor-controlled servers displaying the stolen certificate. One notable aspect of the campaign was the actors' ability to impersonate VPN applications, such as Cisco Adaptive Security Appliance (ASA) products, to perform MitM attacks. At this time, we do not believe that the attackers found a new ASA exploit. Rather, they likely abused the trust relationship associated with the ASA's SSL certificate to harvest VPN credentials to gain remote access to the victim's network. This MitM capability would allow the threat actors to harvest additional VPN credentials. As an example, DNS records indicate that a targeted domain resolved to an actor-controlled MitM server. The following day, Talos identified an SSL certificate with the subject common name of "ASA Temporary Self Signed Certificate" associated with the aforementioned IP address. This certificate was observed on both the actor-controlled IP address and on an IP address correlated with the victim organization. In another case, the attackers were able to compromise NetNod, a non-profit, independent internet infrastructure organization based in Sweden. NetNod acknowledged the compromise in a public statement on February 5, 2019. Using this access, the threat actors were able to manipulate the DNS records for sa1[.]dnsnode[.]net. This redirection allowed the attackers to harvest credentials of administrators who manage domains with the TLD of Saudi Arabia (.sa). It is likely that there are additional Saudi Arabia-based victims from this attack. In one of the more recent campaigns on March 27, 2019, the threat actors targeted the Sweden-based consulting firm Cafax. On Cafax's public webpage, the company states that one of their consultants actively manages the i[.]root-server[. ]net zone. NetNod managed this particular DNS server zone. We assess with high confidence that this organization was targeted in an attempt to re-establish access to the NetNod network, which was previously compromised by this threat actor. Notably, the threat actors were able to gain access to registrars that manage ccTLDs for Amnic, which is listed as the technical contact on IANA for the ccTLD .am. Obtaining access to this ccTLD registrars would have allowed attackers to hijack any domain that used those ccTLDs. How is this tradecraft different? 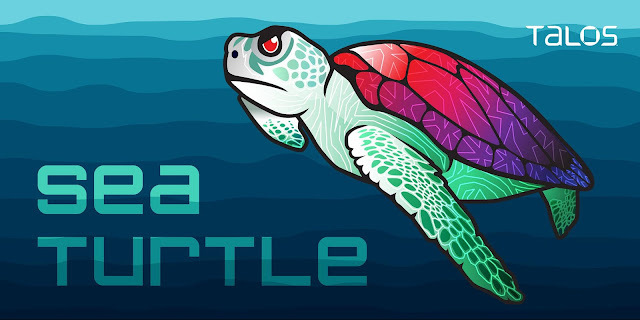 The threat actors behind the Sea Turtle campaign have proven to be highly capable, as they have been able to perform operations for over two years and have been undeterred by public reports documenting various aspects of their activity. This cyber threat campaign represents the first known case of a domain name registry organization that was compromised for cyber espionage operations. These actors perform DNS hijacking through the use of actor-controlled name servers. These actors have been more aggressive in their pursuit targeting DNS registries and a number of registrars, including those that manage ccTLDs. These actors use Let's Encrypts, Comodo, Sectigo, and self-signed certificates in their MitM servers to gain the initial round of credentials. Once they have access to the network, they steal the organization's legitimate SSL certificate and use it on actor-controlled servers. We believe that the Sea Turtle campaign continues to be highly successful for several reasons. First, the actors employ a unique approach to gain access to the targeted networks. Most traditional security products such as IDS and IPS systems are not designed to monitor and log DNS requests. The threat actors were able to achieve this level of success because the DNS domain space system added security into the equation as an afterthought. Had more ccTLDs implemented security features such as registrar locks, attackers would be unable to redirect the targeted domains. The threat actors also used an interesting techniques called certificate impersonation. This technique was successful in part because the SSL certificates were created to provide confidentiality, not integrity. The attackers stole organizations' SSL certificates associated with security appliances such as ASA to obtain VPN credentials, allowing the actors to gain access to the targeted network. The threat actors were able to maintain long term persistent access to many of these networks by utilizing compromised credentials. We will continue to monitor Sea Turtle and work with our partners to understand the threat as it continues to evolve to ensure that our customers remain protected and the public is informed. In order to best protect against this type of attack, we compiled a list of potential actions. Talos suggests using a registry lock service, which will require an out-of-band message before any changes can occur to an organization's DNS record. If your registrar does not offer a registry lock service, we recommend implementing multi-factor authentication, such as DUO, to access your organization's DNS records. If you suspect you were targeted by this type of activity intrusion, we recommend instituting a network-wide password reset, preferably from a computer on a trusted network. Lastly, we recommend applying patches, especially on internet-facing machines. Network administrators can monitor passive DNS record on their domains, to check for abnormalities. CVE-2018-7600: RCE for Website built with Drupal aka "Drupalgeddon"
The threat actors utilized leased IP addresses from organizations that offer virtual private server (VPS) services. These VPS providers have since resold many of these IP addresses to various benign customers. To help network defenders, we have included the IP address, as well as the month(s) that the IP address was associated with the threat actor. The following list contains the threat actor name server domains and their IP address.